• Mikey Action Figure, in retro Kenner style! • Poseable 3 3/4-inch ReAction figure from The Goonies! • Includes a "copper bones" key accessory! •Exciting retro action figure from Funko and Super7! • Order now to ensure you get yours! Get your very own retro action figure from The Goonies! 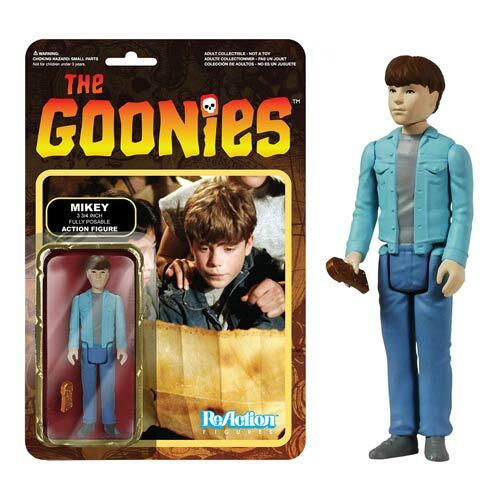 The Goonies Mikey ReAction Retro Action Figure features the main character, Mikey, as portrayed by actor Sean Astin. Measuring 3 3/4-inches tall, this fantastic articulated ReAction figure from Super7 and Funko comes with a "copper bones" key accessory. It has a look and style that harkens back to classic action figures made by companies like Kenner. Ages 14 and up.